ข้อมูลที่เคยได้ยินได้ฟังและผมคล้อยตามในเหตุผล จึงมักใช้อธิบายคนที่อยากเข้าใจเรื่อง perfect shot แบบง่ายๆ อย่างนี้.. I thought this one should be similar to the steeping time for french press. As such, the timing is when the water hit the ground until you finish the brewing process. As I think it’s difficult to see when the water hit the ground in espresso setting, it seemed to me to count the time when you push the button, saving for some second the water about to drop to the ground. Or I’m wrong on this! Thks Khun Z and Khun วุฒิ for expert opinions krub. I think this kind of a more detail instruction is needed for newbies, making life easier to them for their coffee journeys. I compare this kind of instruction to cooking. Professional cooker usually said add this thing to “taste”, fried this one to “perfection” or a “pinch” of salt (whatever the pinch mean and how do you scale it if you want to cook more than the recipe, etc. This further confused amateurs, IMHO, and chase them away, losing a chance of adding new customers to your shop. In this case, the perennial favorite cookbook like the Joy of Cooking do solve the newbies problem with ton of details like fire level, minutes you cook each type of food. I know coffee brewing is more complex but I would like to see more of such detail book like that. 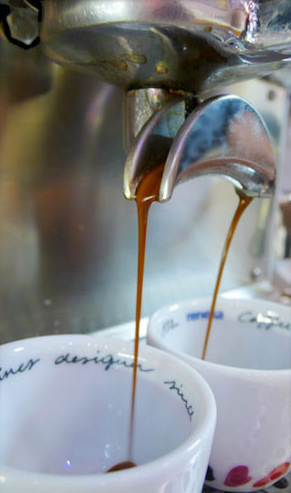 The coffeegeek website comes close but detail of each method is everywhere one has to really take time to read/search. The better one is a “hand holding” method, ie walking prospective buyer through the machine he owned/bought from you until the guy mastered the art. I only see this practice at hkcoffee.com in Hong Kong as entrepreneur loves to do big things/big businesses, ie selling bean to hotel, etc. than just serving one small client at a time. It happens everywhere but once one mastered it, it’s lots of $ to be made. Look at how big banks used to avoid retail customers until the computer capability kicks in, allowing them to earn much higher profit with relatively low overhead. เคยอ่านข้อมูลมาบ้างแต่ผมก็สงสัยอยู่ว่า Perfect Shot ว่าเอาอะไรมาวัด Moka Pot, Drip, Aero Press ฯลฯ อะไรต่างที่ไม่ใช่เครื่องมันทำPerfect Shot ได้มั้ยน้า..